ADHD prevalence has risen in parallel with rising prevalence of pregnancy smoking and childhood obesity. The objective was to determine the epidemiological association of pregnancy smoking and childhood obesity with ADHD. A cross-sectional community study was conducted in 2006 using a parental questionnaire. A total of 1,074 schoolchildren aged 5–11 years were enrolled from 15 primary schools in a lower socio-economic area of Merseyside. ADHD was defined by the question “does your child have Attention Deficit Hyperactivity Disorder, (ADHD), which has been diagnosed by a doctor?” The prevalence estimates for childhood obesity, maternal smoking during pregnancy and childhood ADHD were 14.9% (116/777), 28.0% (269/955), and 3.4% (32/945), respectively. 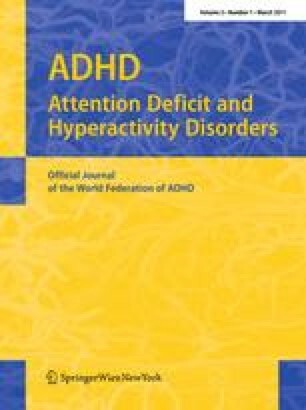 ADHD prevalence increased fivefold in children with obesity (RR, 4.80, 95% CI 2.2–10.4, P < 0.001) and more than twofold in children of mothers who smoked during pregnancy (RR, 2.44, 95% CI 1.2–4.9, P = 0.02). Regression analysis adjusting for obesity, overweight, maternal smoking during pregnancy, heavy maternal smoking, household member smoking during pregnancy, doctor-diagnosed asthma, preterm birth, and low birthweight showed significant independent associations of ADHD prevalence with obesity (AOR, 4.66, 95% CI 1.57–13.89, P = 0.006) and pregnancy smoking (AOR, 3.19, 95% CI 1.08–9.49, P = 0.04). There was a positive dose–response association of ADHD with the number of maternal cigarettes smoked during pregnancy. Measures to reduce both smoking among pregnant women and childhood obesity might reduce prevalence of childhood ADHD. The co-operation of Mr Greg Harper from the Liverpool School of Tropical Medicine and Dr. Jane Richardson, who helped with optical reading of the questionnaires, are gratefully acknowledged. We thank the head teachers and school children for participating in the study. The 2006 survey was funded by the Liverpool Children’s Research Fund and Leverhulme Research Fund.